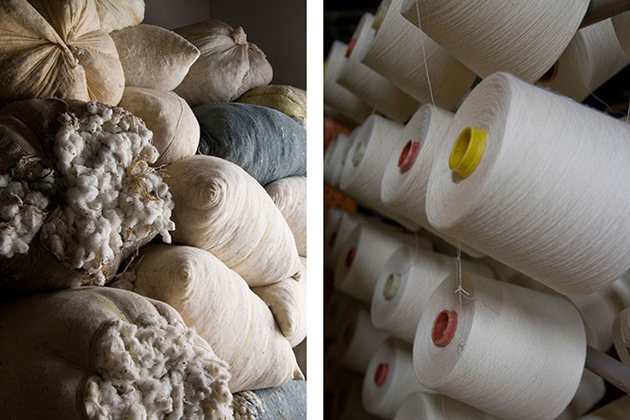 For quite a while now, there has been a growing desire for our clothes to be not only beautiful and carefully crafted, but also to respect ethical, ecological and human values in production. And, while many brands have embarked on the journey of making ethical clothes, only a few were, strangely, able to give their impeccable work on materials and production processes, an equally compelling form. French fashion brand Veja is one of those rare breeds who have managed to fuse together thoughtful production processes with impeccable design. Their meticulous work with local produces is carefully documented on their website and forms the central aspect of their advertising – which, interestingly, Veja refuses to otherwise use. Used to heavy branding strategies and even heavier product prices, looking at Veja’s products we can only ask, how do they actually do it? We are really passionated about celebrating new, talented designers and we believe it to be especially interesting with young talents that help put their countries – that traditionally wouldn’t be considered fashion-forward – on the fashion map. 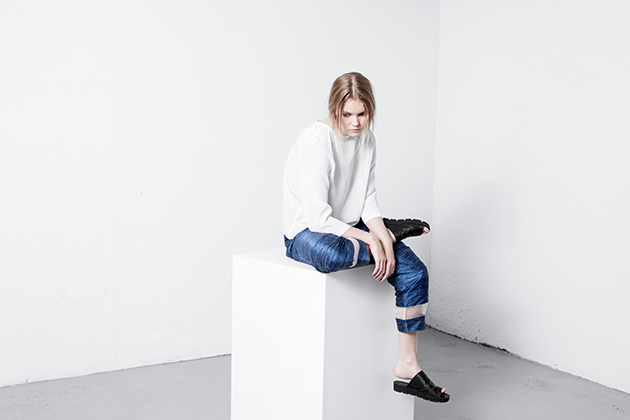 The designer behind the upcoming brand Kyrja is Iceland-native Sif Baldursdóttir. 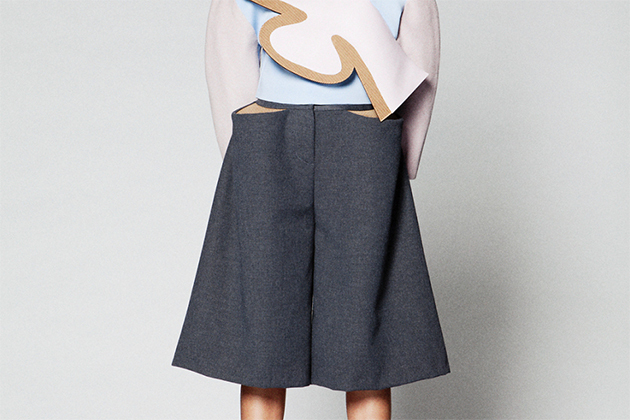 She graduated from Istituto Marangoni in Milan in 2010 and founded her own label two years later. 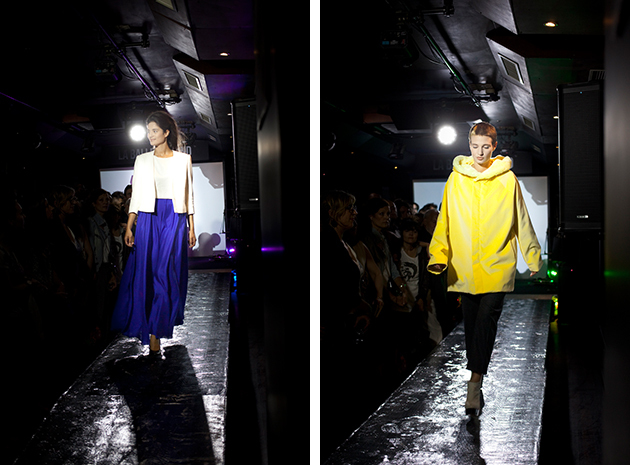 Her debut collection was launched for A/W 2013, which led to Kyrja’s first award, with the prestigious “Looking forward to in 2014…” prize at the Reykjavík Grapevine Design Awards. The brand has captured the raw and clean design aesthetic that often is referred to as Scandi-chic and combined that style expression with natural and exclusive fabrics such as silk, mohair and bamboo. The result is high quality design that feels urban and contemporary, minimalistic without being boring. The focus is placed on details such as great cuts, interesting see-through details and, last but not least, Baldursdóttir’s amazing sense for materials. The whole feeling of the brand is based on an effortless, yet chic look that can be spotted on the streets of any big city in Scandinavia. It’s the typical look for a genuine cool girl that succeeds with looking cool without even trying. Baldursdóttir has found her own expression among many Scandinavian design references with a style that will put both her and Iceland on the fashion map. The best stories are often told by small details. When thinking about a look, shoes are often something complementary, something that goes along and completes other – more important, more visible – choices. But looking at the past, the diversity of the history of fashion can only be caught by individuating the net of relationships between great personalities, some exalted, some forgotten, that have given shape to fashion as a multifaceted experience we consider it today: a balanced ensemble of clothes, accessories, fantasies, myths and desires. Andre Perugia is surely one of these personalities. 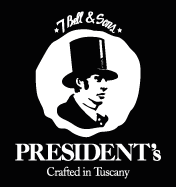 Perugia is remembered as one of the first acclaimed shoe designer and maker whose name has been synonymous with style and inventiveness for an extremely long period of time. 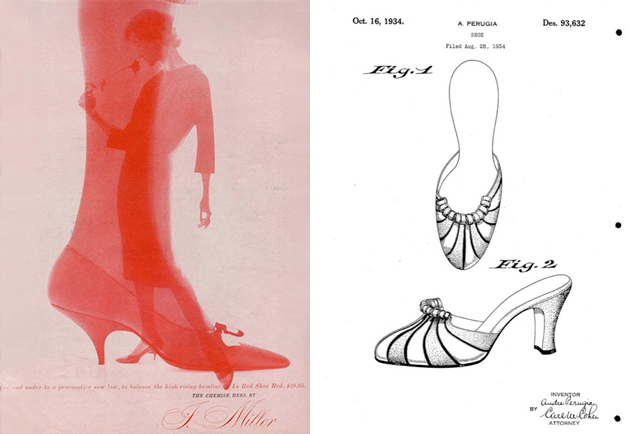 His career spanned from the 1920s to the 1960s, He was quite revolutionary, not only in the designs themselves, but also in the way he approached shoe design. After learning the technical skills from his father, he set up his own boutiques, the first in Nice, his hometown, and then in Paris. His abilities as a maker developed working in an aircraft factory during First World War. The precision needed in that sector opened up his mind to the possibility of applying ‘science’ to shoemaking; this made him halfway between a maker, an engineer and, of course, a master createur. He collaborated with the designers who ‘made’ history of fashion, from Paul Poiret to Elsa Schiaparelli and Christian Dior; he was also a collector of art, and many of his designs are hommages to his favourite artists, from Braque to Picasso. 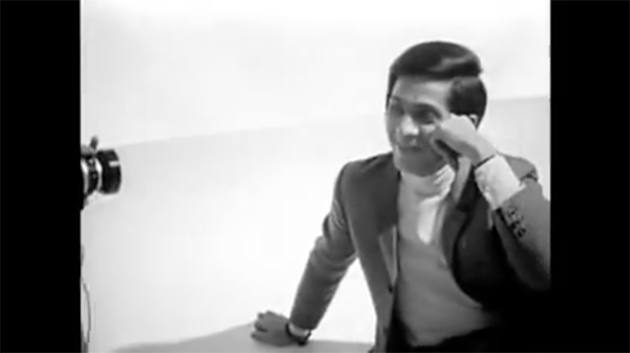 His last collaboration was with Charles Jourdan – he acted as consultant to the company between 1960 and 1966 – to whom Perugia left his personal archive after his death in 1977. Most interestingly, he was a pioneer in giving value to his design by patenting his models. This denotes the growing consciousness of makers in their own capabilities and, above all, their inventiveness and creativity. As a common raise of consciousness, many designers from the 1920s onwards started to care about copies and looked for ways to protect their work. Madeline Vionnet, maybe the most remembered case, used to make videos of her apparently simple designs, in order to safeguard not only her products, but also, and more importantly, her creative process. Thinking about material property, it is interesting to see how these designers started to reclaim the authenticity of their products, as symbols of craft, quality, value and identity. Perugia’s designs were extremely precise and considered the aesthetics and the use as well, confirming that to shape a shoe is to shape a walk, and of course the confidence of the person who wears them. Infamous is his quote: “A pair of shoes must be perfect as an equation and adjusted down to the last millimetre, like a piece of engine”. It is difficult to point out one feature that can characterise Perugia’s works. Each piece shows a different skill, and his keenness to put ahead a concept. 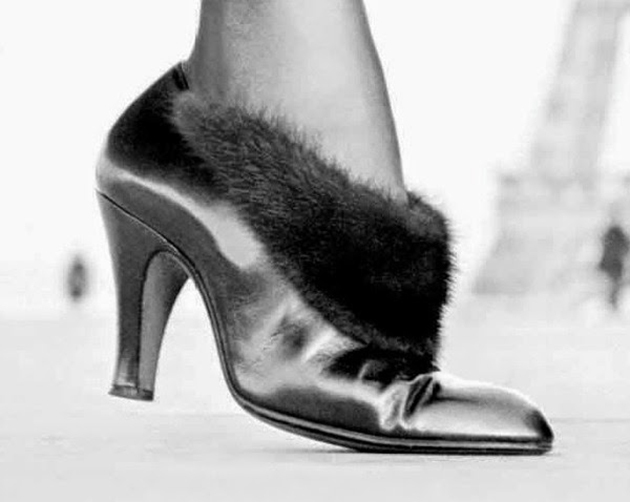 Some of his ‘inventions’ – this is maybe the best way to call them – are incredible in their consideration of both ‘wearability’ and look; for instance, the Desappearing Pump or ‘Vanishing Vamp’ made for Givenchy in 1955 was a visual adjustment to make the foot more elegant, playing on what was visible while walking. 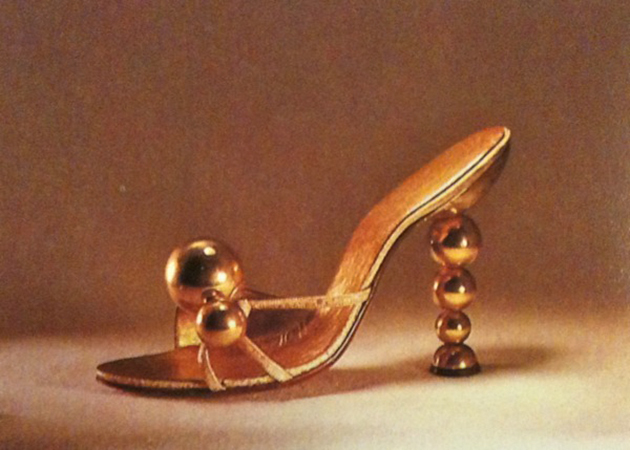 Shoes designed by André Perugia are kept in museum collections all over the world –in the Bata museum in Toronto, in the Met in New York, in the V&A museum in London, in the Kyoto Costume Institute, among others – and jealously possessed by private collectors, but his story has never been publicly told. 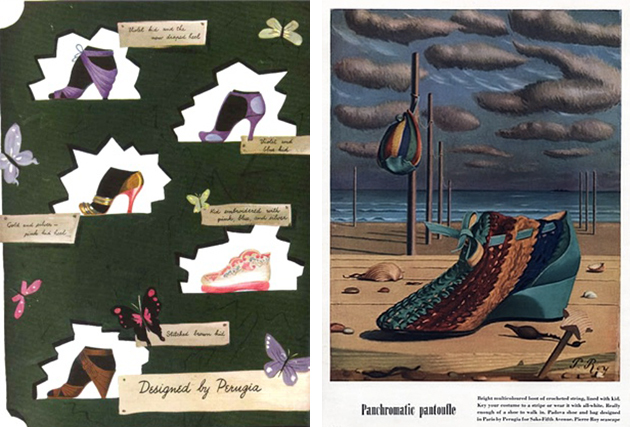 It is interesting to know that the exhibition ‘Shoes: Pleasure and Pain’ at the Victoria & Albert Museum in London showcases many pieces designed by Perugia, alongside typical, historical and contemporary iconic pieces. His name pops up in the exhibition, catalysing the attention of who looks for a fil rouge in the historical development of shoes in the 20th Century. Even though Krasimira Stoyneva is a recently established label, the designer behind it is already prominent and features a signature style. 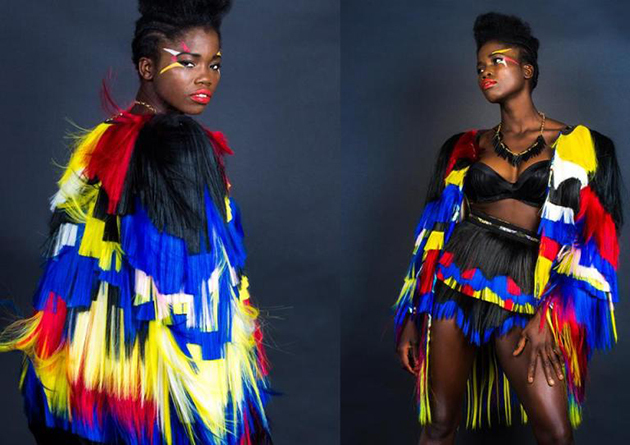 Before founding her own brand in 2014, Stoyneva graduated with a First Class Honours degree from the University of East London and attracted further global attention by wining the High Commend Award by Diversity Now 2014 and the Vogue & Muse Young Vision Award 2014. Her debut collection Future Queens became an international success and it helped to set the tone for her design aesthetic. One of her many strengths as a designes is the fact that she pushes boundaries and discovers new, bold ways to create pieces. 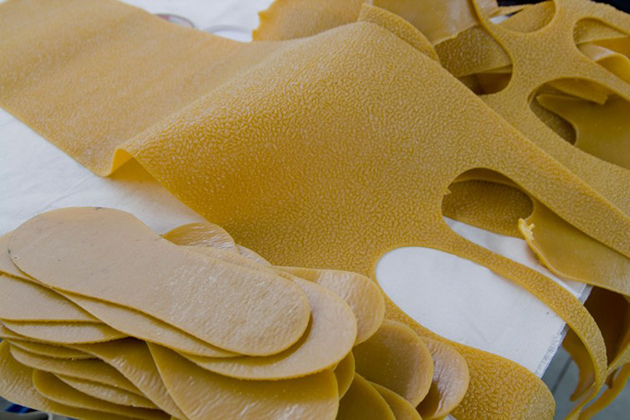 She reinvents new materials in an innovative and curious way, resulting in pieces that are both fresh and cool. 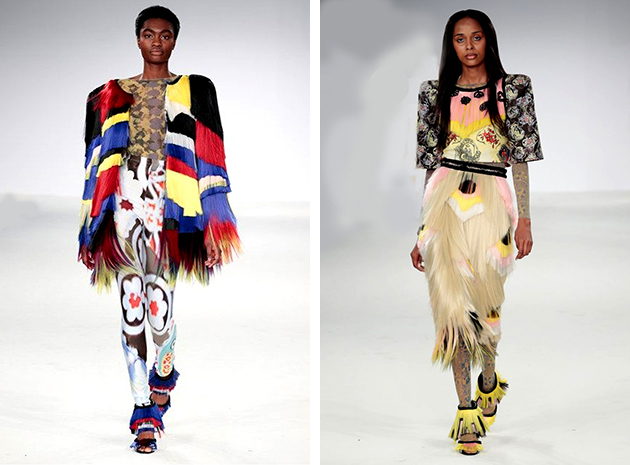 The use of synthetic hair has, for example, become one of her trademarks, combined with bold prints and contemporary cuts. The movement plays a central role in her design and the point she tries to send accross is how such garments look when worn by women on the move. Her pieces aren’t for the shy, instead they are made for women who like to stand out among the crowd, women who aren’t afraid to stand up for themselves. The feeling they create is contemporary and liberating. For the Spring/Summer 2016 season she held on to the original design philosophy, embracing it in a slightly more delicate and feminine way. Silk and its natural movement combined with the texture of hair and delicate embroidering embodies that theme and results in a collection that continues to feel confident, contemporary and most of all, uniquely ’Stoyneva’. Movies are a very direct and immediate means to tell stories. In a society like ours, where the speed is one of the main features of everyday experience, movies are also used as means to document practices, fix moments and draw the attention of the public to particular issues. Many are the movies dedicated to fashion designers, whose cult seems to have reached its peak now, thanks to the aura of accessibility given by social media. Exploiting the communicative power of fashion, designers, in order to be effective on the market, put so much effort in producing images and build mythologies around their products, that they have ended up belonging to popular culture; and this not through the objects they produce, but through their personality. When designers decide – or accept – to go on camera, they are putting forward their image, their name, themselves. Authenticity is surely one of the core issues that comes up while watching these kinds of movies; as Worth’s official photographies were designed in every detail – he choses to depict himself as a createur, appropriating of the symbols traditionally belonging to artists, rather than a clothes-maker – so designers today use the means they have to convey their message, and everything has to be camera-ready. Another issue indirectly brought up by these kind of movies is power or, better, powers: what is the story? who decides how to tell it? what is real and what is made up? what kind of public does the film address? Movies as Giorgio Armani’s Made in Milan directed by Martin Scorsese, and Yohji Yamamoto’s Notebook on Cities and Clothes by Wim Wenders are not just documentaries, but carry the mark of the strong and recognisable hand of famous directors: in these two films the centres of power clearly emerging right from the beginning are two. That of a designer who wants to put himself under the limelight, and that of a well known director with a precise and personal project. Alternatively, Valentino’s ‘The Last Emperor’ is more ‘naive’ in its representation; it seems a straightforward documentation of the conclusion of a process, the last effort of the designer before his retirement. After an event as grand as his exhibition at Ara Pacis in Rome, it is not surprising that he choses a closing line so peremptory as ‘après moi, le deluge’: the end of an era, whose very last minutes are frozen in the film as they were lived, in their greatness and in their reality. The most recent movie that has appeared is Dior and I, which documents quite the opposite of what Valentino did. It reports the very first experience of Raf Simons as designer of Maison Dior. It goes back and forth betweens Simons’ work on his first house couture collection and the thoughts of Christian Dior as written in his autobiography ‘Dior et Moi’. 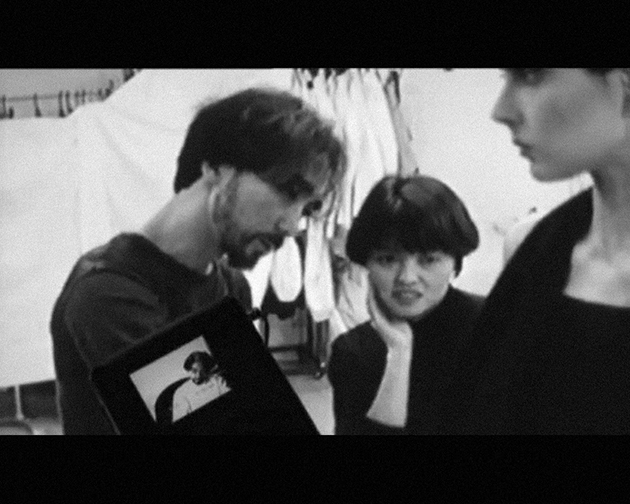 The film is complex above all in what it does not say: it was made after a tumultuous period for the French fashion house, that was in search of a voice that could bring the maison forward, re-establishing a link with its roots. Interestingly, the film doesn’t mention the Galliano scandal. Even though they seem to enter a process in medias res and freeze a practice that is quite cyclical and repeats itself, with some natural variations, every six months, these films engage with milestones, rather than with the everyday; notwithstanding this, the repetitive patterns are the one on which directors and designers rely to convey authenticity, also in its historicised symbols: the toile, the patterns, the whole atelier as narrative topos. The matter does not end up here, though. These poles of power are just the most accessible and immediate – the designer, the director, the ‘moment’ captured by the camera. And authenticity is not something that can be measured by simply sticking with definitions – movie, reportage, documentary. Since the stories are based in real life, there are many other actors, both on and off the screen, and many implications that contribute to the narrative; there is no key to the ‘right’ reading of these films. It is up to the public to chose how to engage with them. What is sure is that they can be considered as a material to critically engage with design, and complicate the reading of relationships, society and culture. The fashion world has always been looking for new talents, but the desire for the new seems to be even more urgent today. While this offers numerous opportunities for upcoming designers – be it through awards, apprenticeships, or endorsements – it also gives them less time to build their own voice before being pulled into complex dynamics of commercial viability and production. It is obvious, thus, that this results in a frenzied fashion climate which, in the long run, risks of harming the creative aspects of design process. Shouldn’t spending time working independently be preserved and regarded as the true moment of development in fashion? For young talents, figuring who they want to be as designers, is central to how the fashion world will be shaped in the coming decades. 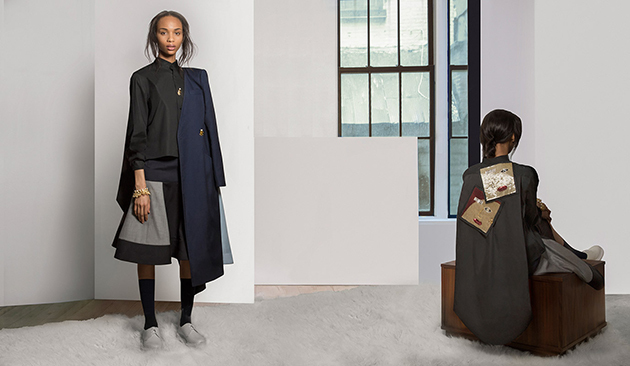 One brand that has embraced its research process successfully and found its own expression is the Brooklyn based label, Harbison. In just a few years Charles Elliott Harbison, the founder and Creative Director of the brand has created a design aesthetic that feels at the forefront of all that is interesting and cool. After studying fine arts, painting, and textiles at North Carolina State University, fashion at Parsons School of Design and holding internships at Michael Kors and Jack Spade, he started his own brand in 2013. During his studies, Harbison become particularly interested in the modern movement, a frame of reference that still holds a great impact on his design. In his A/W 2015 collection, colour contrasts have played an important role, both in more graphic patterns and in combinations of materials. Perhaps mindful of the Modernist maxim ”form follows function”, his silhouettes are clean, feminine and with a strong urban feeling. Taking time to understand who he is as a designer, has resulted in work that is clear in its conception and true in its references – as should any design product be before it reaches the final fashion judges – the consumers. There are many words that define the moment in which fashion is publicly presented: fashion show, catwalk, runway. Between all the semantic possibilities, which involve nuances and references both to history, to the kind of movement performed – it is difficult to chose the one which is able to define what actually goes on, every six months – or, I rather say, more and more often – on the stages that fashion colonises. To pin down the term that can actually gather all the different expressions, I’d go for fashion show, which holds together the idea of an exposition, be it still or in movement, of clothes which represent a flair, a style. Fashion shows were actually not as ‘narrative’ as we consider them today. They were born to gather buyers and journalists and inform them of what a fashion house was producing. They are the tri-dimensional evolution of the circulation of plates and aimed mostly at enlarging the area of commercial influence. 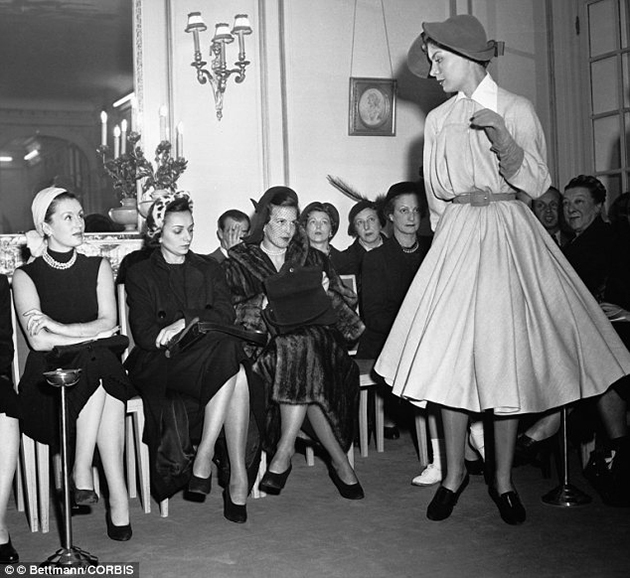 Fashion shows, for some countries – as Italy in 1951 – came up as a moment to showcase national identity; and that’s how they are seen today by the so-called upcoming fashion cities. 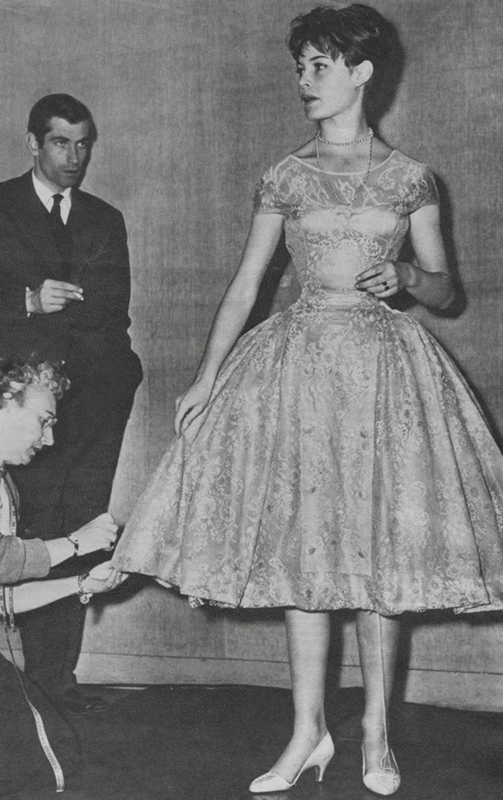 The story behind fashion shows is complex and layered, but just stopping at the surface – that is, at their appearance as spectacle – is interesting to get some clues about the directions of design today. What emerged as an economic tool has rapidly become advertorial, and then opened up to the myriad of possibilities that the stage offers; and what kind of ‘animal’ are fashion shows becoming now? The question arises after the latest fashion month – and, most of all, the Parisian spot – which has pushed the boundaries between fashion show and performance art, blurring the lines more and more. While most of the shows followed the ‘regular’ format of the catwalk, just reflecting upon the space in which models had to move, some designers have exploited the potential of the fashion show as a moment highly regarded by the press and the public. 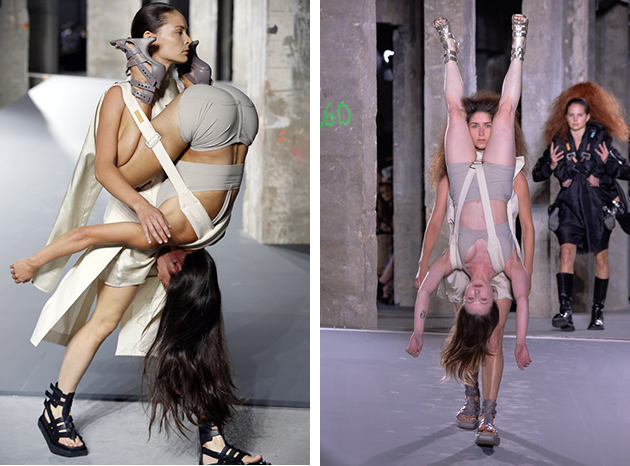 Rick Owens sent out couples of models-performers bounded up, one actually ‘wearing’ the other; they were not professional models though, and their bodies were informed of their profession, and far from the typical fashion silhouette. 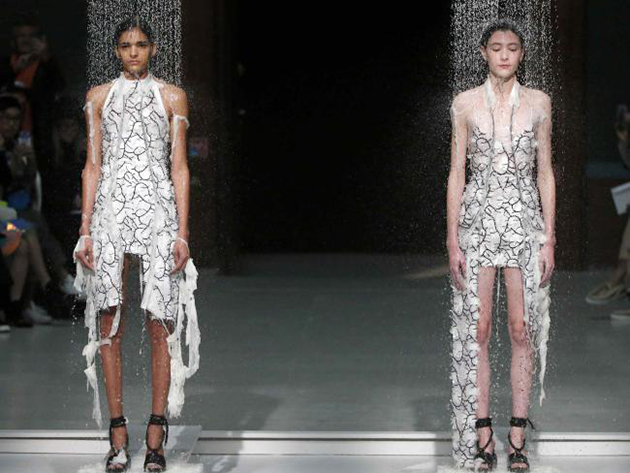 What Hussein Chalayan did was not even a catwalk: two models standing still in the middle of a crowded room were literally showered with water, which acted like a solvent on the clothes they were wearing, revealing other clothes underneath the first layer. I don’t know if the world ‘performance’ suits these kind of events, though. It is not just a matter of ‘like or hate’ anymore: fashion shows seem to be trying to become a meta-narrative operation, which waits for the reception and above all for the participation of the public to be complete. Nevertheless, they still portray something that is neither replicable nor empathic, and they present a reality that is true just within the border of fashion experimentalism. The participation of the public is surely central, above all considering the impact of social media not only on fashion as a show, but also on fashion as a product, but the positions and hierarchies are still very defined. What is negated by these very actions that fashion practitioners are staging is indeed the materiality of fashion; it is not an economic matter anymore: fashion is a pretext to produce actions that surely do not want to be a mere showcase, nor they are meant to be just for a public of professionals; but also, they are not just highly ‘instagrammable’ moments, which get their value by the number of thumbs-up they receive on social networks. Even if, in the Chalayan show, clothes are actually the centre, we are not looking at them as a product, but as part of a process, a metaphor for the intricate relationship between instability, change and authenticity. 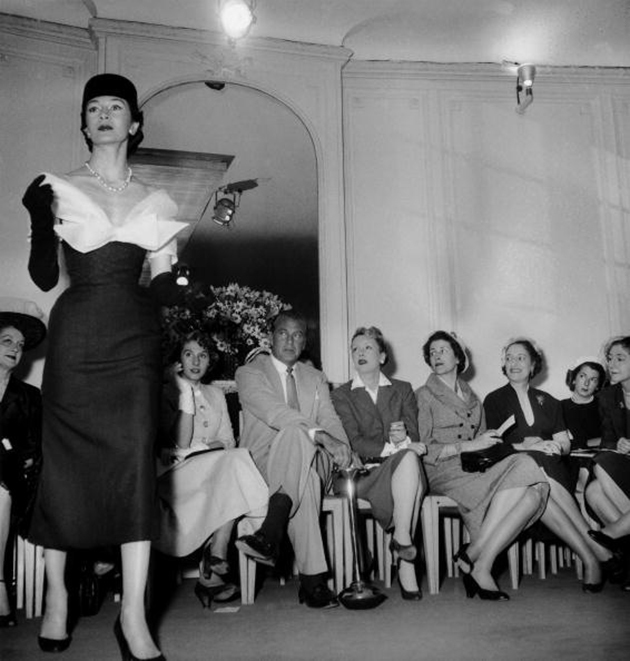 The core problem is, then, what role do clothes have in this evolution of the runway? Does their design match with the shape of their presentation? Does it come before or after the idea of the show? What is clear is that these operations are re-defining the meaning of fashion itself as a wide platform in which clothes are just one of the elements that define design as a practice, and design as a spectacle. Even though we’ve left Paris Fashion Week behind us a couple of weeks ago, there are still some lingering news to address. About a week ago it was unexpectedly proclaimed that the co-founder of urban Parisian label Vetements, Demna Gvasalia, would replace Alexander Wang as artistic director of Balenciaga. But what could this mean for the future of Balenciaga fashion? As Wang concluded his reign over the French brand with an underwhelming final collection, it opened space for Gvasalia to bring forth a new side to Balenciaga. If we look at Gvasalia’s background, it does seem that he might have the knowledge needed to continue this great house’s legacy. Georgian designer Demna Gvasalia is a graduate of the Royal Academy of Fine Arts in Antwerp. 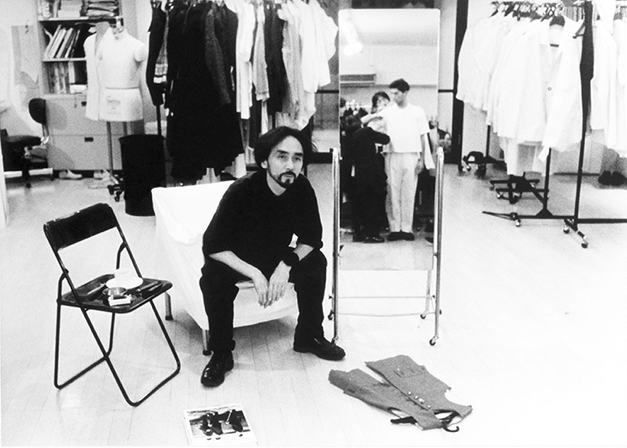 After leaving the prestigious design school, he led design teams at both Maison Martin Margiela as well as Louis Vuitton. Subsequently, he launched the Vetements label in 2014, basing it on the concept of urbanity, everyday street-life and a season-less modern wardrobe – all notions that gave the brand a sought after coolness factor. Vetements quickly became a favorite among fashionistas and qualified for a nomination for this year’s LVMH Prize. When reviewing the past work of Gvasalia, the first thing that comes to mind is an effortless edge to each look. It is a unique quality that brings streetwear to a more elevated spectrum. In Vetements’, collections there have always been looks with differing elements on the front and back, bright colours and unexpected references. Thigh high leather boots in vivid colours gave a minimalistic pencil skirt a coquettish wink. 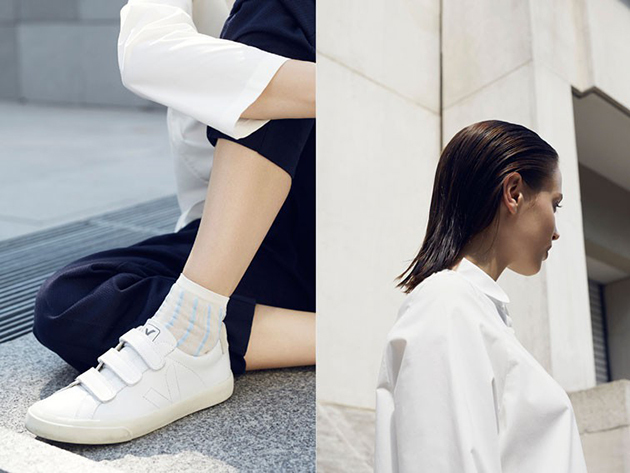 Such playful vibes can help Balenciaga attract a new clientele without alienating the old. Even though Gvasalia has yet to prove himself in the haute couture there is a clear point of view to this designer that can marry well with the Balenciaga label. Gvasalia has expressed his thoughts in not always pushing the limits of fashion by creating something crazy, but instead, creating something we could believe in. This is a clear philosophy that echoes through Cristóbal Balenciaga’s heritage. 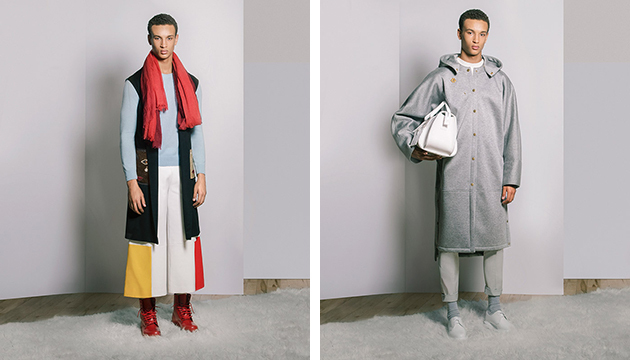 Balenciaga was famous for adding precious elements to simplicity, making it deliciously grand – an approach that Demna Gvasalia has made his own. What to say about Paris, the home of haute couture and a city that is so closely related to fashion, that they have almost become synonyms? The French capital has played an important role in fashion history and some would even go as far as calling it the birth town of fashion. Despite the fact that other cities have found their own place in the world of contemporary fashion, Paris will always have it’s history and a whole bunch of international brands. It is, therefore, also a place where many new designers choose to educate themselves and start their careers. So even though Paris has closed the Fashion week tour for this time we can’t leave the city before summarising the best upcoming designers seen last week in the French metropolis. Lucie Brochard graduated from Ecole de la Chambre Syndicale de la Couture Parisienne in 2005 and is now merging all her experience from traveling through Asia, America and Europe into her own brand. 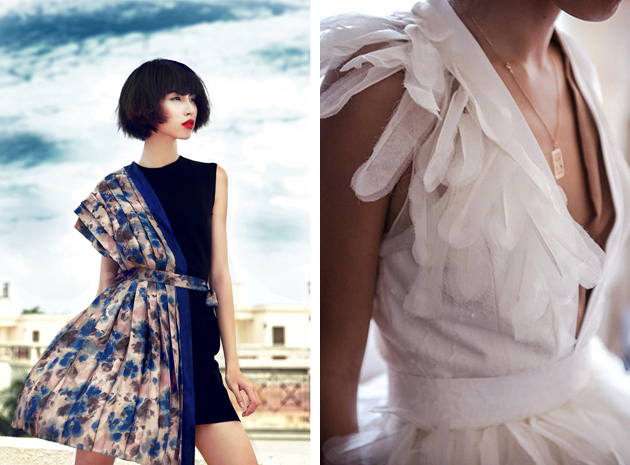 Her design is all about the modern, creative, elegant and spontaneous travelling women. Her collection draws inspiration from well dressed women she has seen at airports all over the globe, who succeed in dressing impeccably without compromising with comfort. 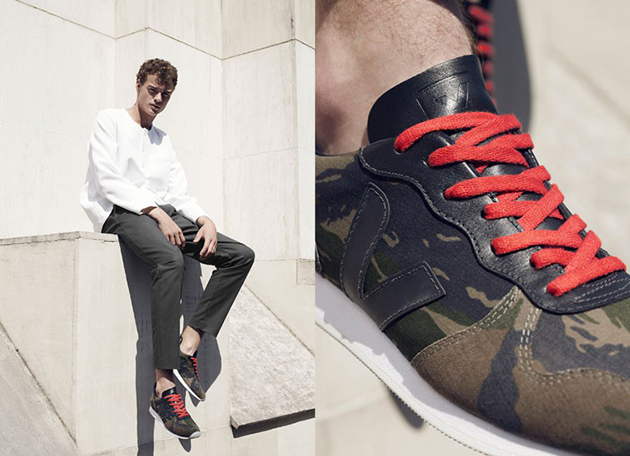 Arnaud Lazérat is a Paris-based brand that combines the traditional French handcraft with urban influences. It is both eccentric, powerful and fun – inspired by stage costumes and custom-made dresses, resulting in pieces that address both women and men and encourage free movement and comfort. 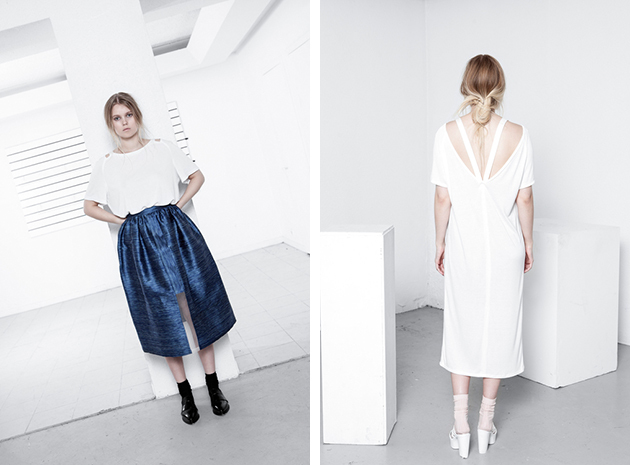 Karen Topacio is a designer who recently graduated from IFA in Paris and now has founded her own, self-titeled brand. She defined her style at her graduating show in January 2015 and has continued with that approach in her most recent collection, which can be best described as innovative, crisp and playful. She combines an architectural take with technological influences – all with the aim of creating wearable, cool and original pieces. 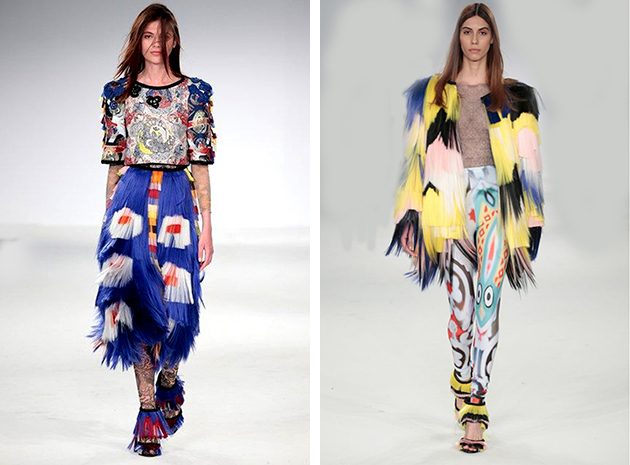 Jasmin Brar is another designer who recently graduated from her fashion studies at Istituto Marangoni. She is now based in Paris and makes all her pieces by hand, aiming to make luxury womenswear with focus on unexpected and at times a bit odd details – resulting in pieces that brings couture to the contemporary fashion. The wide range of Paris Fashion Week showcased the infinite possibilities looming in the future of fashion. 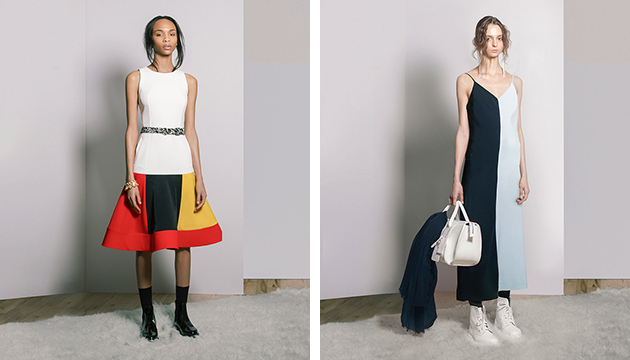 The inspiration was everything – from punk princess to clean minimalism. However, three main trends stood out in terms of materials, technique and accessories. Seeing Sequins – If you can think of anything to cover in sequins or mosaic – you’re on the right way to mimic what was presented at Paris Fashion Week. Dresses, cardigans, tops and bottoms were all sparkling. Loewe presented a loose fit pant with big mirror mosaic on them that added another dimension to the trend of sporty chic. 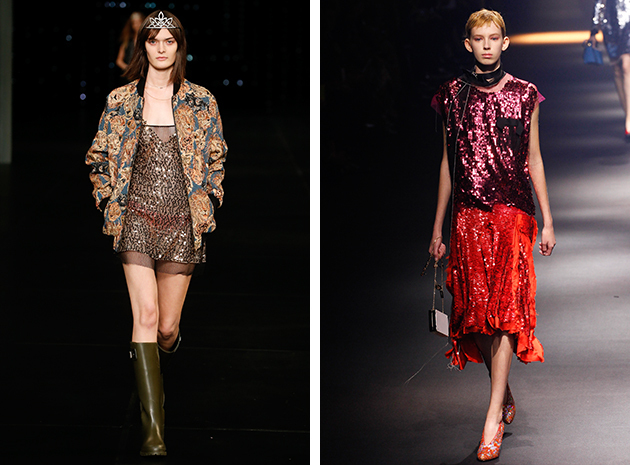 Lanvin and Saint Laurent both presented sparkling dresses in combination with something more casual like a bomber jacket. Sonia Rykiel blended in sequins on long sleeved tops with a formation that created the illusion of coordinating jewelry. It was an interesting comment to the evolution of street style: adding something that was once considered appropriate only for partying to the everyday wardrobe is now the fashionable thing to do. 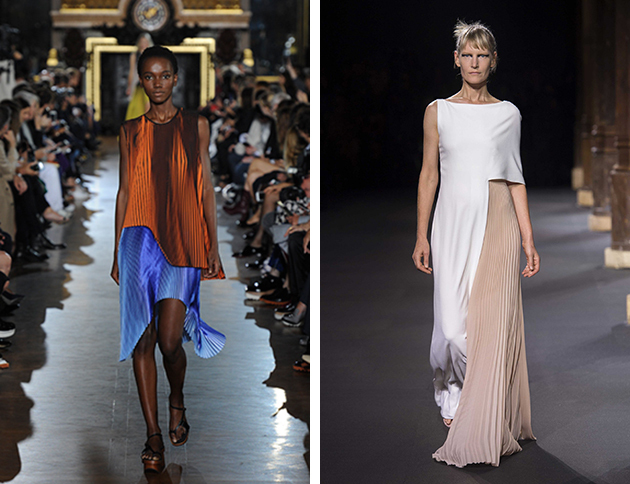 Pleats Please – A popular technique used when playing with shape and volume, pleats were presented at several Parisian runways as a way of adding complexity to something simple, a final extra twist to catch the eye. At Vanessa Seward A-line tops and shift dresses were made more interesting with the addition of pleats, making them stand out instead of blending in the crowd. Vionnet stayed true to its roots and experimented with a somber colour scale – letting pleats and more structured parts intertwine brought the notion of what’s going to be important in 2016. Finally Stella McCartney proved that pleats can be a fun way to play with colour and imposed an ombré effect without actually using ombré, producing, in turn, depth without moving from the surface. In the Middle – The discussion lingering on after Rick Owens’ fashion show was focused on the human accessories hanging from some of the models, but this functioned as a humoristic or critical accent to leather details other models wore around their waist. 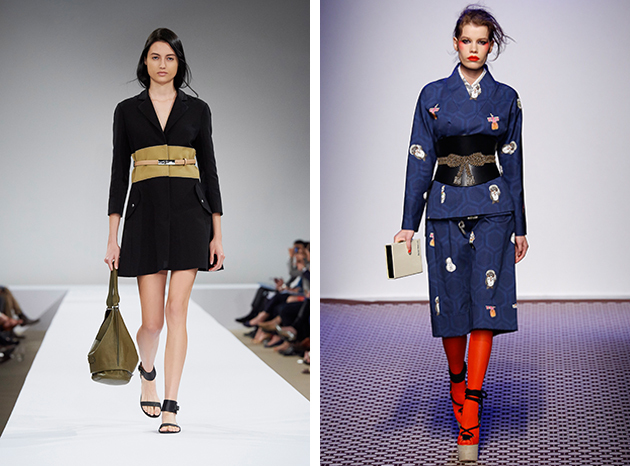 A wide or asymmetrical obi-belt was viewed at other runways as well, like, for example, Olympia Le-Tan. 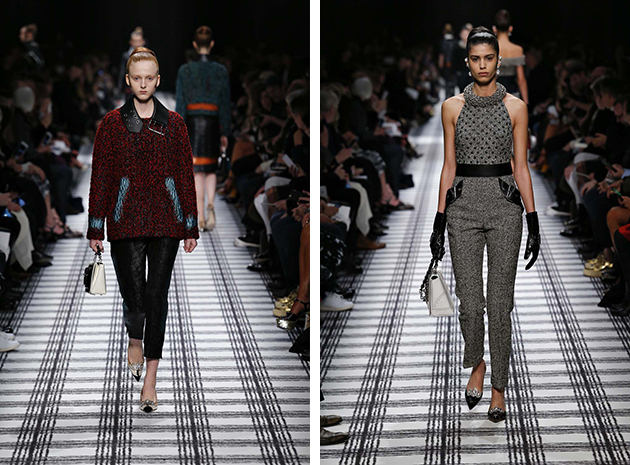 At Longchamp they also presented a trompe de l’oeil version by belting a contrasting effect of the coat.